there are places I remember…all my life Though some have changed. Some forever not for better. Some have gone and some remain. So aptly crooned by John, Paul, George and Ringo. I am as I type……la la la laaaaa hum hum hummm…. Sometimes the most powerful memories and attachments our families hold on to are of places. The places are the event hosts, the welcoming port in a storm, the elevator music of our lives. These certain spots grasp time and happenings in a way that we mortals can never wipe clean. A place is not always a house, it could be another building~ like a church or school or business. Those are almost a given, but “place” can also be an intersection of two roads, a lake shore, or an event not precisely plot-able on the maps in our head. How about the time you spent the day with cousins at a little carnival and lost all of your hard earned grass cutting money on baseball throws at milk bottles? 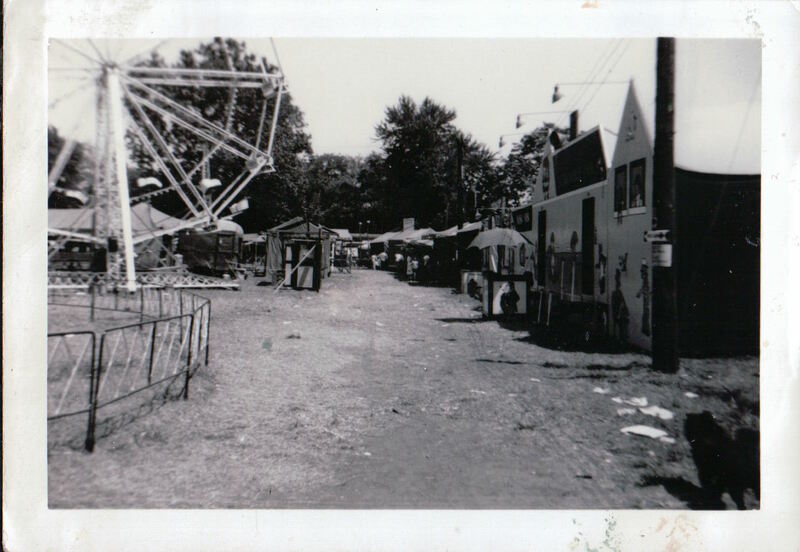 Maybe you do remember where the carnival set up, or maybe you just remember the carnival and it’s mesmerizing midway lights as the place. Which version of “place” is more important to your story? Which was more important to you while it was happening? My husband’s Grandfather “Estal” was “something else” a real…how should I put it?…”character.” At family gatherings and holiday get-togethers he always managed to sneak his way into the nearest liquor cabinet in search of some “Wild Turkey.” Shortly after bagging his “Turkey” or whatever else he could find, it was not uncommon to find him rummaging through women’s purses looking for unattended cigarettes. Once he and the scavenged cigarette were both sufficiently “lit” the stories of places would begin. One of his favorites was about “Little Rock Arkansas.” There were other places he liked to talk about too, all with rather lurid and inappropriate recounts of escapades of the “young Estal.” Mercifully, Grandma Lydia’s ears would usually perk up from two rooms away, and she would come zooming to the rescue and shut him down before he could get too far into the uncomfortably intimate details. Not always, but most of the time. Ew. The point being, although these tales were coming from the whiskey inspired lips of an old, half-senile geezer, with little to no social filter, “place” was always the starting point of his dissertation. That is of course if you skip the pre-storytelling preparations of Turkey hunts and cigarette foraging. In my own family places are christened with names that are verbal shorthand for addresses, or the occupants, or incidents. They are referred to in ways like “White Avenue, the Old Man’s, The County Line, Perry, 104, the Farm, the Cabin and the New House. There are also references to places in ways they relate to time like “during the War,in the Flood, and under the Highway.” Place can be a pretty big deal in our stories. Often, it is like an extra character because the setting can make an enormous difference as we describe it (or ignore it). I personally, love using descriptions of places or settings in my own writing. Sometimes just seeing a photo of a place will elicit the starting point for the telling of a story you’ve never heard before. As relatives reminisce about a picture or event listen to the “place-chat” closely. And, if you write in a style similar to mine (I try to use the voice of the person I am writing about as much as possible), be careful to also annotate the actual address or name of the place if you can! “Out at the farm” is a very clear description for my current day readers, but when someone picks this up to read in 20, 50 or 100 years will they have a sense of where you’re writing about? The advent of Google Maps and especially Google Streetview has made this describing and locating from afar thing a whole lot easier! Don’t hesitate to tuck in a printed out page to help future generations relate to the story you’re writing today! So try throwing in the location any time you get a chance. Yes, you may have the info from Ancestory.com that a family was living in Louisville during the Great Depression just by finding their info pop up on a census. But look closely in the margin on the left and you can find their street name and house number. Imagine finding the same home today on Zillow or Trulia and seeing photos from the curb, and even the front parlor! How cool would that be? And if it’s not too far away, maybe a weekend road trip would be worthwhile to snap a photo of the fancy entrance gates to the new housing addition that is going up in the middle of Great Grandpa’s cow pasture :). Every step we take now to deepen and anchor these stories will bring us and future generations closer together through time. That’s a pretty cool thing to think about when you’re getting tired of writing… or, when a song is stuck in your head…or you feel like none of it amounts to much…or when your own Estal starts Turkey hunting. The place John Lennon (who sings that song) loved and remembered was Durness on the north coast of Scotland. He had a mixed up childhood and loved holidays there with his aunt. Lovely song! Truly lovely place! Love your historic Indianapolis site link. I’ll look for something similar in Dallas. Dallas is in for a treat!